Labour has sought to distance itself from a series of pro-Jeremy Corbyn Facebook groups that feature anti-Semitic, racist and abusive comments. A report published in the Sunday Times claims to have uncovered more than 2,000 of such messages. A Labour spokesman said the groups are not connected to the party in any way. Newly appointed member of Labour's ruling body, comedian Eddie Izzard, said the party must "stamp out completely the stain of anti-Semitism". The report is the result of a two-month investigation by the Sunday Times into the 20 biggest pro-Corbyn Facebook groups. Among the messages was praise for Adolf Hitler and threats to kill Prime Minister Theresa May, the paper said. Meanwhile, one of Labour's biggest private donors has told the Observer he has left the party over its failure to deal with "the most blatant acts of anti-Semitism". Sir David Garrard, who has donated £1.5 million to Labour since 2003, told the paper: "I have watched with dismay and foreboding the manner in which the leadership has, in my view, over the last two years, conducted itself." With negative stories on the front pages of at least four newspapers, this is not a happy Easter Sunday for Labour. The online abuse highlighted by the Sunday Times investigation shows a problem the party has with a relatively small number of people willing to use racism, misogyny and threats of violence in support of Jeremy Corbyn. Labour has denounced the behaviour and distanced itself from the groups. Mr Corbyn has condemned, criticised and apologised time and time again. But after a bad week for the party, things have not improved. 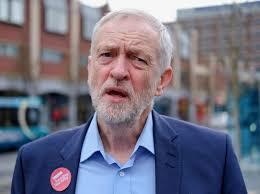 The leader has admitted that Labour must "do better" in tackling anti-Semitism, but with no apparent quick fix at hand and no let-up in accusations, he has some way to go to convince everyone in his party that he has a grip on the problem. The Sunday Times says the Facebook groups covered in its report have a membership of around 400,000 people including 12 senior staff working for Mr Corbyn and shadow chancellor John McDonnell. Comments in the groups show members advocating violence, reports the paper. It also said it found messages comparing the Conservatives to Nazis and suggesting a journalist should be killed. Writing in the newspaper, Jewish Labour MP Luciana Berger said she had received an email from someone who claimed to be a party member telling her she should kill herself. She had also been called "Judas", "a venal piece of detritus", a "Zionazi" and an "absolute parasite." A spokesman for the Labour Party said: "These groups are not run by the Labour Party or officially connected to the party in any way." Labour also told the Sunday Times that no-one in Mr Corbyn or Mr McDonnell's offices has seen, posted or endorsed anti-Semitic or abusive messages. Owojela’s Blog understands that Mr Corbyn has since deleted his personal Facebook account, although his Facebook Page, a separate type of account for public figures and organisations, remains active. The latest allegations mark a deepening in the row over anti-Semitism in the Labour Party which has dogged Mr Corbyn for the past week. It erupted when Mr Corbyn himself was criticised for opposing the removal of an anti-Semitic mural in east London in 2012. On Saturday, senior Labour official Christine Shawcroft resigned from the party's ruling body, the National Executive Committee, and was replaced by comedian Eddie Izzard. It had emerged that she had opposed the suspension of a council candidate accused of denying the Holocaust. In a statement Mr Izzard said: "Although this isn't the manner in which I had hoped to join the NEC I'm honoured to step up and represent Labour members at the heart of our party." Concerning the anti-Semitism row he said Labour "must make amends and repair the damage with the Jewish community as Jeremy Corbyn has promised to do." On Friday Mr Corbyn admitted Labour must "do better" over its handling of anti-Semitism.